Welcome to Red Twig Studio! A unique image was on my minds screen when I woke this morning. It struck me in such a personal way that my first conscious breath was a gasp. 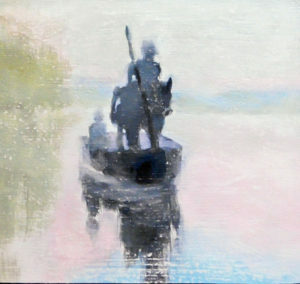 There was a man, on a horse, in a boat, with a child being transported across the water. I don’t like explaining a symbolic image. I like the essence of a thing to speak for itself. So simply I will say that to me, the child is innocence and he/she is being carried calmly and safely back home. To me this is a souls journey. And I love the image. Sometimes I find myself being drawn into a conversation with an image that is unique to me – maybe off the path that I am currently on. The issue of art transitions is a sticky one for me. I was walking past my neighbors house this week when the teenage boy who lives there drove into the driveway. He excitedly told me about getting lost and having to call his Dad for directions twice before finding the way home. He was exhilarated and did not choose to get lost. What interested me was that he was never more than 20 minutes from home – no matter where he was. And sometimes getting lost is like that. We feel disoriented but we just can’t see how things are all connected. 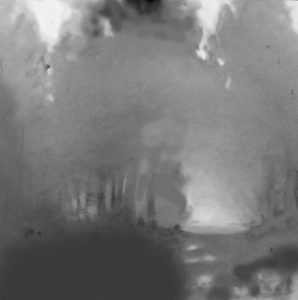 So while learning to paint fog, I also learned how much detail was actually needed to convey a place or subject. And when it came to this unique image, I had enough understanding of minimal imagery to engage with it in a natural way. So lately I am beginning to leave my fear of being off my path. Instead I can see that the paths converge as I am the eyes, I am the voice of the path and I bring to everything – what I am. I was online and ran across a website whose opening phrase was: the internet is a loud place. What struck me about the line was how often I feel those words. It feels like the world is a loud place and I wonder if other people feel this way as well. So, I was thinking about art I see. It is obvious that my work is quiet. 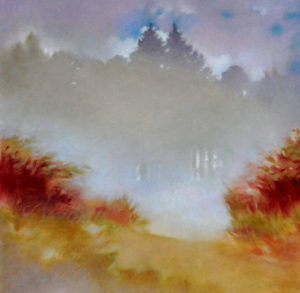 Painting fog is naturally quiet. I began to see a trend in my own perceptions of current art. Firstly, there is artwork that is decided exciting. But, I sense that I would like a way for my work to have power, but not necessarily drama. And like everything else in life you make the decisions that fit you and let go of the rest. But, then I dug deeper. I realized that, especially over the last year, when I needed to find a new place to work – one that would provide me with space and landscape features conducive to my work…..I found myself confused. Should I go to a location that has obvious dramatic features? That on the surface seems easiest to work with? A dramatic landscape holds within it many possibilities to work with and can feel more exciting and visually accessible. However, as the year progressed I felt myself drawn to locations that were mild and undramatic. Small rivers, low fields and not many imposing shapes. But, what was really interesting, was not why I was choosing the modestly visually appealing locations. The internal mechanism of image making is one where – if I am presented with something magnificent, I feel a sense of urgency or importance in capturing this great place. But, my own internal homing device was looking for something else. Placed before a less dramatic landscape, something else has a chance to happen. I had been visiting a nearby lake. Just a short drive from my house. My expectations were low about what end results I might create. The lake has a nice but very small bay on it. As I drew this location something really nice happened. I did six small images from the same spot. By the fourth image I was starting to make changes in my approach to the image. I extended the foreground, and started working with open gestures and editing my image by simply feeling what it should be. I started to follow my instincts of image making. I forgot whether the location was important or not. The end results were that I made a leap into what I was able to do – that I had not made before. It was freeing – and now I look back and see that I was just waiting to make this leap. So it goes that the small aspects of the world are often the places that I find transcendence. Leaving some habits behind and finding a quiet and receptive place to create something new. This is where the magic often is for me. Today I found a spot to draw- off a quiet road away from traffic. It was within the Skokomish Tribal Center, giving me a view of Hood Canal with emergent trees and shrubs growing out of water. I liked the simplicity of the view with soft grays in the distance and darker trees close to me. I set up my collapsible easel and started working. Traffic was scarce, so I feel a mostly peaceful feeling, but I don’t want to linger. I become very focused when drawing, seeing all I can and keenly listening. It is noisy – there are gulls, ducks and with great happiness I hear eagles surrounding me from every angle. They are talking to each other. It feels like they have softened their voices in the dense fog and are having a kind of personal chat between themselves. It takes a few minutes to register that one of them is just over my head, which flies off when it sees that I see it. After about five minutes there is a ruckus in front of me. The noises seem loud and I imagine that my ears are not adapted to the way sound travels in quiet places, but even so there is an especially strange sound coming from the water………like fins or wings slapping mud, or maybe a human with oars awkwardly moving into the mud, sand and silt. I continue to work becoming more deeply engaged and quiet – and then (to my astonishment) in my view is the noise source – a huge sea lion swimming along the surface, breathing heavily out as he skims the water. It is at least 8 feet long. I can see it’s beautiful round body moving up and down gracefully like a whale. Then there is another one, brown and then another that is creamy and lighter in color. They are all fishing the salmon and this a good spot. I am gratified and filled with bliss when my concentrated drawing flow is united with the joy of being with wildlife – as they live their lives and I am just another part of it. This feeling is a pure happiness for me. It satisfies me that I am so quietly focused that they don’t notice me, or if they do, they are OK with me. Recently I went to see Seattle artist, Mitch Albala talk about landscape painting and his work. Mitch is an outstanding teacher and artist and we share a love of atmospheric images, so I felt I would enjoy hearing him talk. He was sharing that just because a place is beautiful, doesn’t make it a good painting. Spatial cues, contrast, form and structure are all needed to create a satisfying image in 2 dimensions. This brought me to the subject of why do I choose one location over another? It was pretty easy for me to notice and feel that most of my landscapes hold something in the distance and that it is about longing. Maybe that is why I like fog – it is mysterious. Longing comes from the body or heart and is hard to explain. Out in the field, longing generates an intense presence for me which carries the artwork forward. I long for that experience of something beautiful and distant. However, longing can also be an elusive and unsatisfying experience. So, considering this I came to feel that the experience of painting a landscape is about movement through a space. That when beginning a painting, this space is unknown, and by engaging with a painting the space becomes more fulfilling and more known. Georgia O’Keefe has many quotes on this subject expressing similar emotions. One simple quote is “God told me if I painted it enough, I could have it”. To that, I would add that the landscapes I paint – I choose that they be added to my soul’s memory of places I deeply love. One of the most satisfying experiences I have had this summer, has been to more fully understand how to dissolve and build shapes. In the process of painting, I often see elements that are discordant or do not fully integrate into the image. For a long time they were just an undesired element that I didn’t know what to do with. However, for fun, I went out to paint at night along the dark gravel road where I live. I had no idea that the experience would be so exhilarating. The simplicity and lack of distracting details allowed me to focus on what I love best, which is light and atmospheric space. It also seems to have a connection to drawing as I remember it as a child. As a child I could draw with very little concern for the final effect – it was all sensual and immediate with no concerns to spatial relations or composition. Taking away too much detail, and not being able to (frankly) SEE very well in darkness was liberating. Experimenting with these images taught me that I could eliminate whatever I want and that my shapes can be there, or dissolve. With time, I began to alter shapes and make them flow into each other with less boundary between them, as if my trees flow directly into the sky. I have always loved Russell Chatham’s capacity to knock down whole areas of his paintings, so the focus was where he wanted it to be. The softness and subtlety of it – often in grey tones – I find that they “read” so beautifully on the page. One of the challenges of moving from printmaking to chalk pastels has been to search for connections between how I approach them both. My screen prints use “air” or space as a predominant element. People have responded to my prints by saying they look like Japanese art. The use of space or air as a conscious subject does seem similar. In the chalk pastels, I have looked to find a similar feeling of spaciousness. 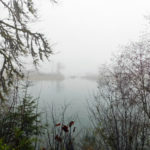 It was a surprise to find that drawing fog or mists on our Northwest mornings, was a subject that felt at home for me. The unique quality of fog is nuanced and not empty space. 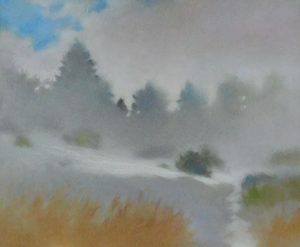 Distant hills take on an atmospheric blue color, but fog takes on a subtle complex of colors that are more layered. Finding these qualities bring to mind a childhood memory of a multi-colored water fountain in my small hometown of Chanute, Kansas. The fountain had lights that smoothly changed from red, to green, to purple etc. It created a sense of wonder and magic in the early evenings when we would drive and visit the fountain, just to watch it change colors. The fog and mist are a little like that to me now. During the last year as I grew into creating art from open spaces, I noticed how I was drawn to different types of music. The music and musicians in my studio became co-creators with me………so often setting the tone in the studio. I was especially attracted to music that “felt” like open land. Fields and beaches – anywhere that I could see for a long distance. I noticed during this time when I felt stressed about something in my life, I would also go and just sit and stare toward the horizon and this seemed to create answers and inclinations that I could rely on. The first musical attractions were toward the slide guitar – with the long drawn out notes and usually without words. I like Ry Cooder’s CD called Paris, Texas. This music and many similar artists has become a part of the studio process. I see the long horizons and the resonances that I feel about open fields and spaces reflected in the music. Completing new work takes time. Beginning with a day in the field – hopefully working without interruption and then followed by months of working with the image. In the end the image may come close to what I felt and saw the day it was begun, but most often it feels like a metamorphosis – an exchange between the image and me. What do you want me to do? that is what I am saying. The image gets stuck and then one day I know what to do – what happened in between I don’t always know. So my files are full of artwork that waits to be communicated with. And many that will never be finished. This pastel is from March of this year. The day was one of really beautiful floating fog, changing the trees and field as it moved. It is called March Path. 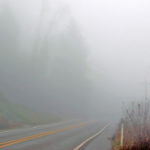 Sometimes I was lucky and found fog plumes or fog clouds…..or in the early evening I found sunsets and fog combined. My favorite location is Scattercreek Wildlife Preserve which is a prairie of large open fields with shrubs and trees along the edges. Fog sometimes has rainbow like effects early in the morning….with soft transitions of blues, purples and magentas as it filters the light. 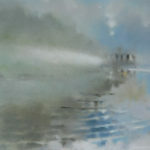 More of these images are in the pastel gallery under the Work section.